Despite the fact that I’m incredibly excited about my new job, there are lots of things I’ll miss about my old one. My relative freedom to make my own schedule, for example. And my amazing third-floor single office with a fantastic window view. Aaand the food. My current company has a top-notch culinary team. Truly — they’ve won competitions. Every day they offer three soups, at least two entrees, multiple grill items and sides, a full salad bar, and a sandwich bar. (Also dessert, but it’s never vegan so it doesn’t count!) And the prices? They’re excellent. Dishes rarely cost more than $5.00, and you can stuff a small salad container pretty darn full of yummy fixins, including vegan-friend proteins like roasted tofu or spicy seitan. There’s at least one vegetarian soup and main dish every day. Usually, one of those dishes (if not more) is vegan. And the vegan dishes rarely cost more than $3.00. I’ve been spoiled, I know. During most of my tenure I tried not to buy lunch more than once or twice a week, but lately I’ve been splurging more often. Because we’re cutting down on grocery shopping in an effort to clean out the pantry, our dinners tend not to provide leftovers. So I’m saving a bit on groceries but spending more on lunch. Worth it! 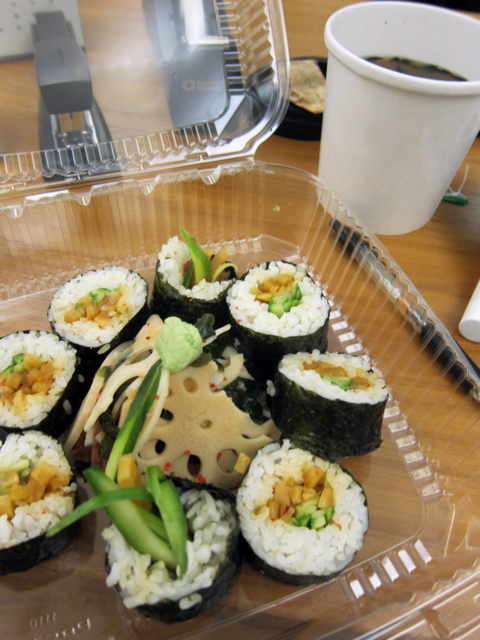 I’ve been snapping photos of noteworthy lunches sporadically for the past few years, but I’ve never shared them. Now seems as good a time as any to do so! Let’s start with sushi! This dish included eight pieces of sushi, lotus root salad, and a cup of miso soup on the side. 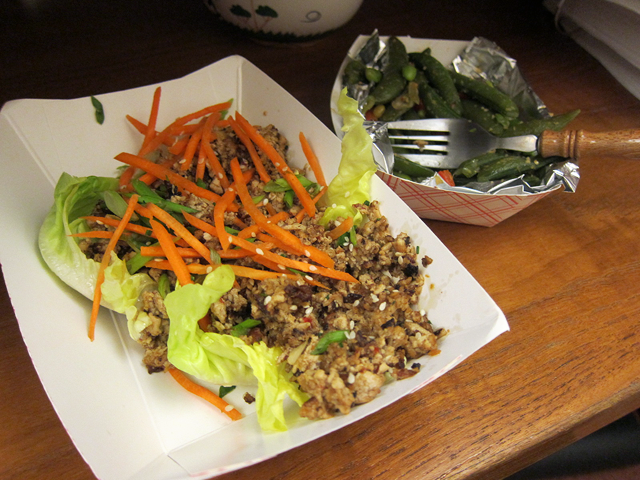 How about a lettuce wrap filled with spicy ground tofu? That’s edamame on the side. This nut- and seed-crusted tofu was savory perfection. 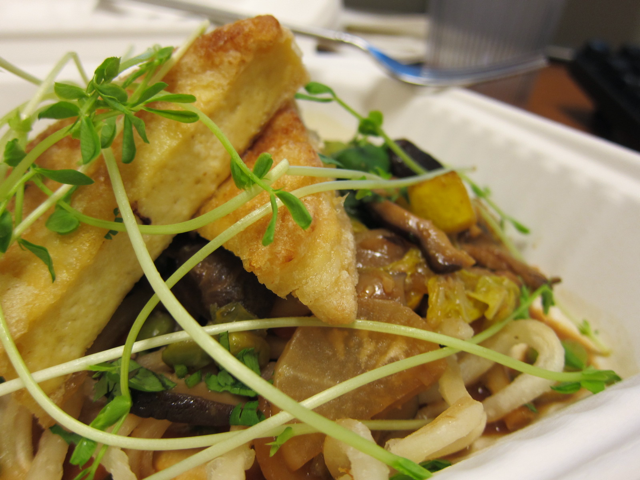 The roasted veggies offered a delicate counterpoint to the heavier tofu. 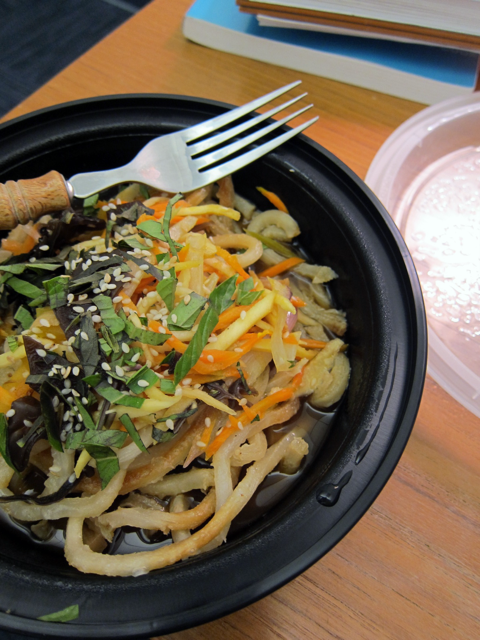 Back to the Asian-inspired eats with udon noodles and veg in a savory broth. 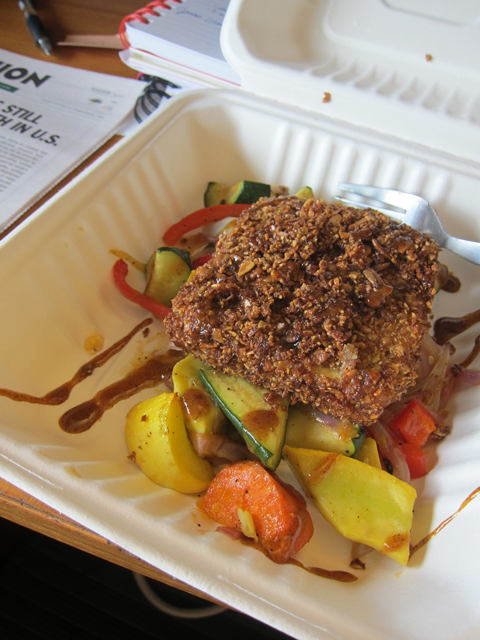 Another nut-crusted tofu! I’m 87% sure this one featured pistachios. 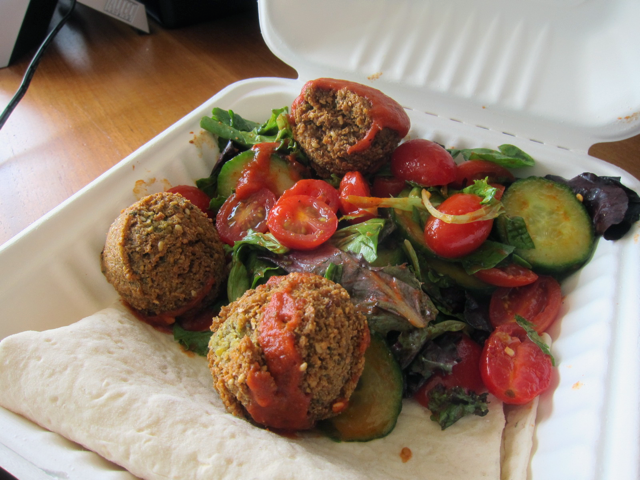 Falafel is never not a good idea, especially when served with lavash bread and a big ol’ salad. Moar tofu! 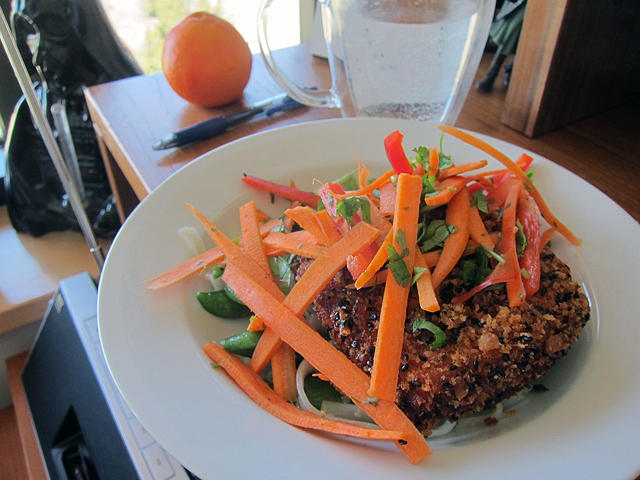 This time it was gently fried and served over udon noodles and veg. 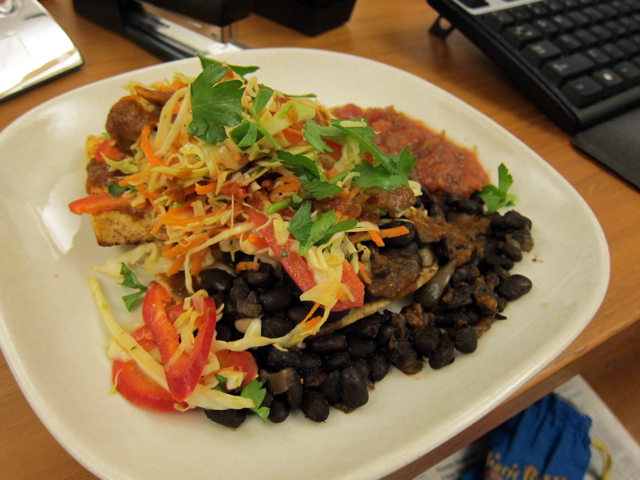 Are you able to find good vegan food at your place of work? Holey Moley that is the food you get at work?! It looks like proper veg restaurant food! I’m just finishing university so haven’t had the experience of ‘work food’ yet…but I can’t imagine anywhere in the UK providing such great options for vegans.